Universe of Synergy: Worst... Olympics... Mascots... EVER! 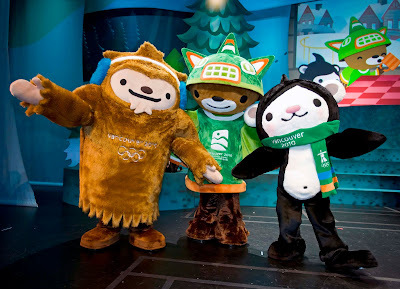 Today the London Olympics Organizing Committee unveiled the mascots for the 2012 Summer Games. And here they are! You can NOT be serious! This is a joke right? Oh no, we only wish it were! According to the organizing committee representatives responsible: "We've talked to lots of children and they don't want cuddly toys..." Well, in that case, you guys hit a homerun! My personal thought is these guys look a bit like a cycloptic version of Cogsworth, the butler-turned-clock from Beauty and the Beast. But even that is a stretch. ... and seriously, are those claws on the blue one's arms? Was there a sale at the used mascot parts emporium? The recently completed Vancouver Olympics actually had decently creative mascots. I do recall not being a huge fan of them at first, however. They were pretty much invented characters, but at least they were worth buying a stuffed one for your kids. Who wouldn't want a happy sasquatch? Beijing's Chinese powerpuff girls didn't suit my taste much, but at least I knew what they were... sorta. Definitely fitting of the Chinese cultural heritage, I could conceivably see the attraction to little kids getting them (collect all 5!). 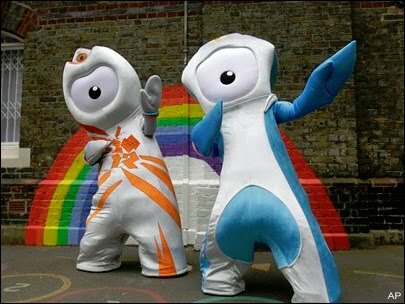 But they pale in badness to the London mascots. Leave it to the Italians to come up with something as simplistic as walking, talking ice cubes. I'm sure these adorned many a restroom door throughout the Olympic Village in Torino. But at least they're somewhat cute. I didn't mind these guys at all... and if anything they reinforced gender stereotypes. Perhaps the London mascots will grow on me over time, but it'll take some work. 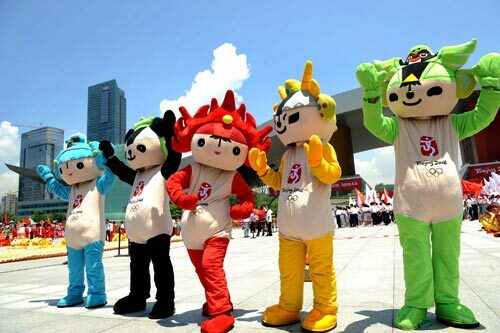 I'm also waiting for the first YouTube video of the mascot falling flat on its face and unable to get up on its own. That will be priceless. I agree. Terrible. 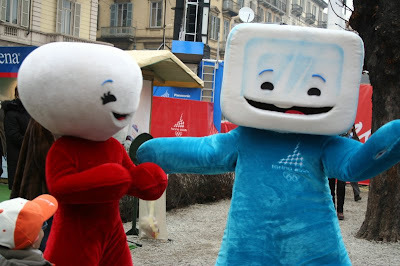 I think the Sochi mascots are a little scary as well.